Bill Robinson in the Hot Mikado (1939). May 25 is National Tap Dance Day. It’s also the 138th anniversary of the birth of the great tap dancer and consummate entertainer Bill “Bojangles” Robinson. (The two falling on the same day is far from a coincidence.) 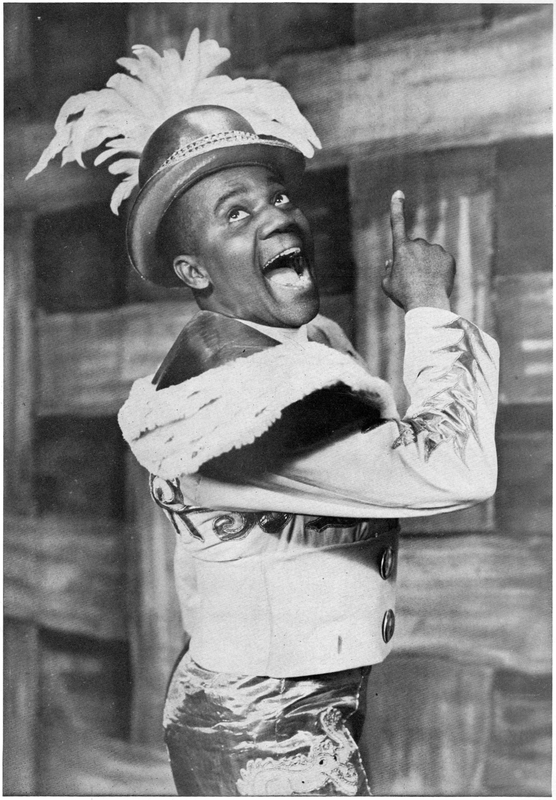 With his characteristic dancing and charismatic persona, Robinson broke numerous color barriers in the show business, and likely introduced the word “copacetic” into the popular lexicon. Bill Robinson was born Luther Robinson in Richmond, Virginia on May 25, 1878, at some point, he switched names with his brother and became “Bill”. Robinson began dancing in front of theaters for tips at the age of five, and was eventually offered work inside the theater. At one point, he had an act with Al Jolson. His career as an entertainer was interrupted when the Spanish-American War broke out, and he enlisted in the Army. Once out of the Army, Robinson embarked on a long and groundbreaking career in vaudeville. After Bert Williams’ death in 1922, Robinson succeeded him as the top black entertainer in the United States. Somewhere along the way, he picked up the nickname “Bojangles”. In 1928, Robinson appeared in Lew Leslies Blackbirds of 1928, and in 1939, he had a successful run in Michael Todd’s Hot Mikado. Today, Robinson is likely best remembered for his film appearances with Shirley Temple, beginning with The Little Colonel in 1935. Also in 1935, he appeared in Will Rogers’ last film, In Old Kentucky. In his own final movie, in 1943, Robinson starred in Stormy Weather, with Lena Horne, Cab Calloway, Fats Waller, and the Nicholas Brothers. Bill Robinson died of heart failure on November 25, 1949. 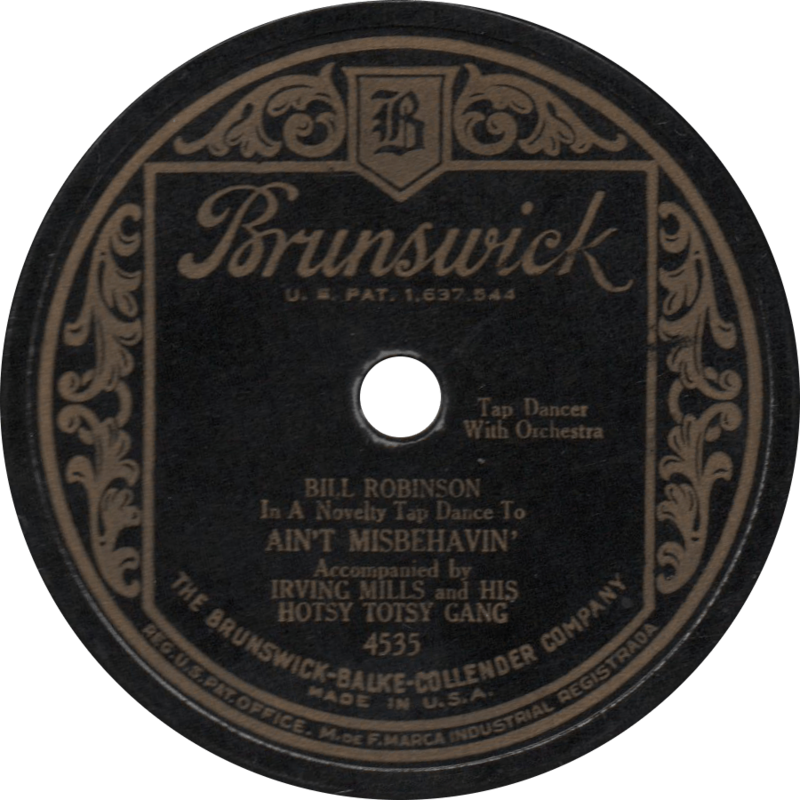 Brunswick 4535 was recorded September 4, 1929 in New York by Bill Robinson, whose tap-dancing is accompanied by Irving Mills’ Hotsy Totsy Gang. The personnel of the band seems to be undetermined, it is most likely a white studio group possibly consisting Mannie Klein and Phil Napoleon on trumpets, Miff Mole on trombone, Pee Wee Russell, Arnold Brilhart and/or Jimmy Dorsey on clarinet and alto sax, Larry Binyon on tenor sax, Joe Tarto on tuba, Chauncey Morehouse on drums and an unknown piano and guitar player. Some other sources however, including Robinson himself, cite it as Duke Ellington’s band. I would be inclined to believe it’s more likely the former of the two. On the first side of this very entertaining disc, Robinson patters with his feet and with his mouth on “Doin’ the New Low Down”, a song he introduced in Blackbirds of 1928. 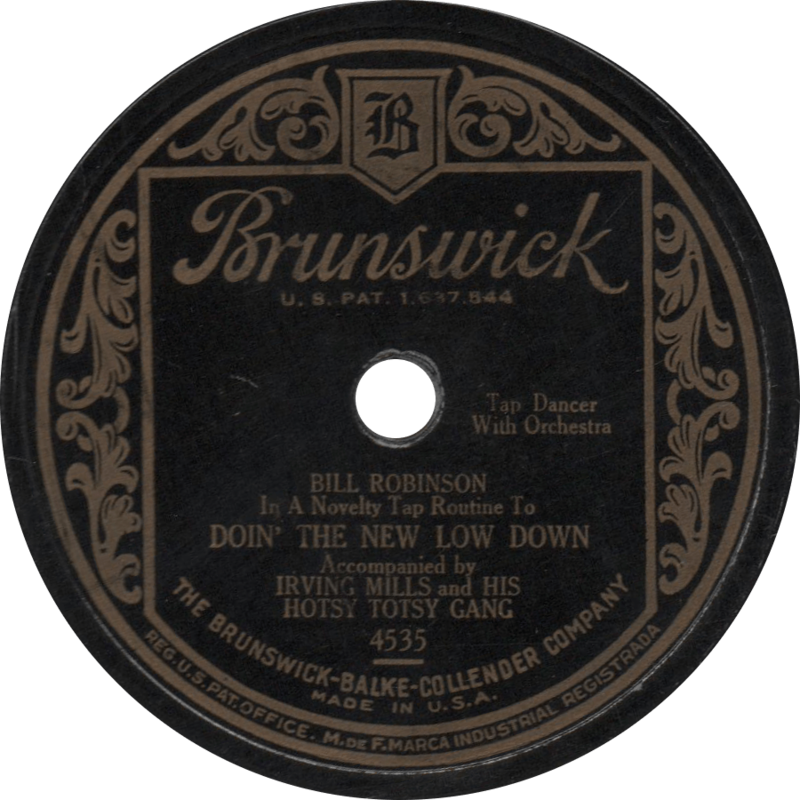 Doin’ the New Low Down, recorded September 4, 1929 by Bill Robinson Accompanied by Irving Mills and his Hotsy Totsy Gang. Ain’t Misbehavin’, recorded September 4, 1929 by Bill Robinson Accompanied by Irving Mills and his Hotsy Totsy Gang. This entry was posted in Records and tagged 1920s, 1929, Arnold Brilhart, Bill Robinson, Broadway, Brunswick, Chauncey Morehouse, Duke Ellington, Irving Mills, Jazz, Jimmy Dorsey, Joe Tarto, Larry Binyon, Mannie Klein, Miff Mole, New York, Pee Wee Russell, Personality, Phil Napoleon, Tap Dance, Vaudeville by R. Connor Montgomery. Bookmark the permalink.